Kaski, ITWAN Taxi & Micro unit has organized training with cooperation Traffic police to minimizing the road accident on the National campaign program. In the program chief guest ITWAN secretary Cde. Bishnu Bahadur Parajuli has distributed campaign sticker “I’M Responsible Driver”. He further said that under the Central Campaign 48 thousands transport workers throughout country will sensitize on minimization of road accident. Likewise, ITWAN Gandaki Province President Cde. 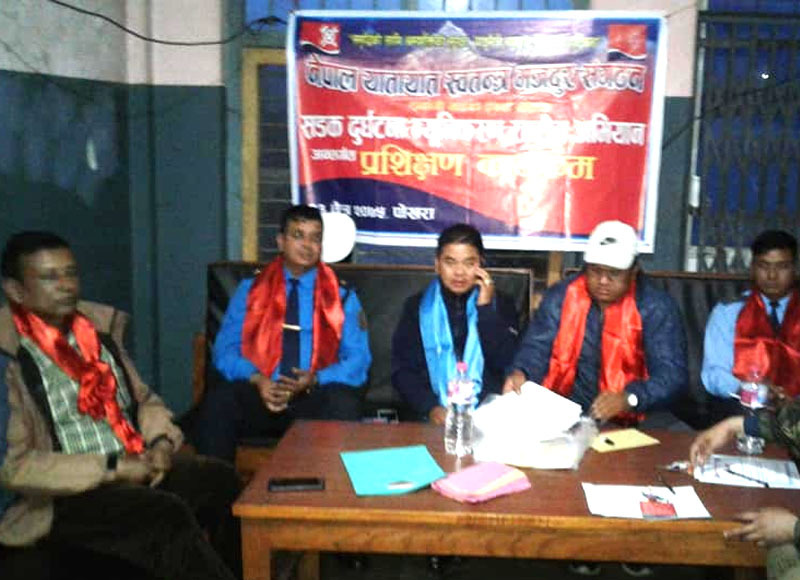 Bishnu Bahadur Khatrai Said “ to preserve achievements all the transport workers should unionized and fight for the transport workers rights & Contributory Social Security in transport sectors. On this occasion, 52 members of ITWAN were given traffic training certificates.